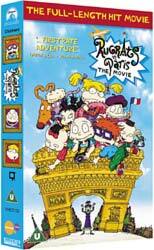 For a comparison of "The Rugrats Movie" and "Rugrats In Paris" DVDs, click here. 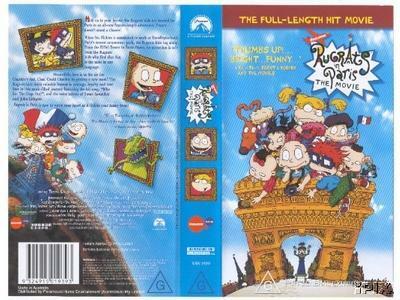 For a look at "Rugrats In Paris" bootlegs, click here. 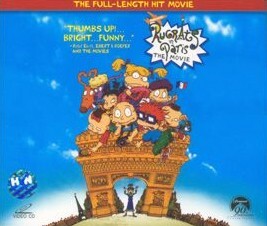 In the US & Canada on 3/27/2001, Rugrats In Paris was released on home video, in VHS and DVD. the VHS tape retails for US$22.95, while the DVD retails for US$29.95. Expect the film to be sold for less at many places. 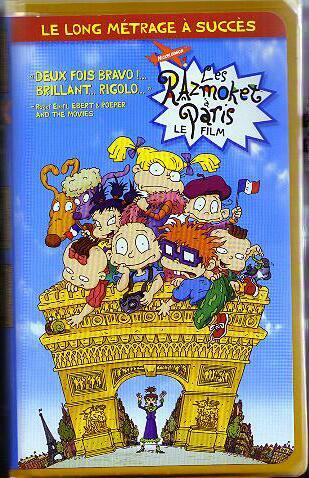 The VHS version is pan-and-scan, and is available in English or French. 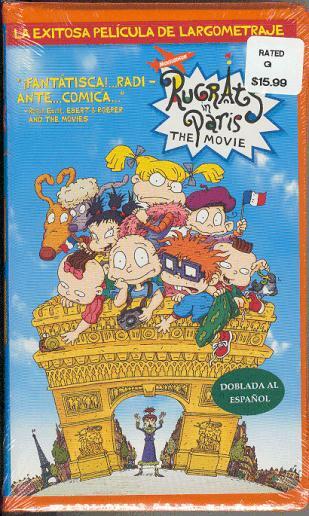 The Spanish-language VHS version of the video was released in the US & Canada on 7/31/2001; it has the same contents as the English VHS video. 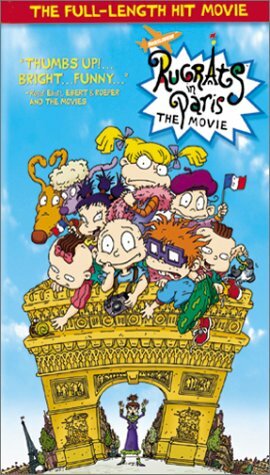 The Spanish version was released 4 months later than the English and French versions, due to the fact that the film was still debuting in theaters throughout Latin America through July, plus the fact that most of Latin America use NTSC video. To discourage Latin Americans from getting a Spanish video before the theatrical release date in their country, the Spanish video is delayed until the film was released in theaters in all Spanish Latin-American countries. What Was In The Alternate Endings? Ending 1 - Coco and Jean-Claude have new jobs loading passengers into the "Ooey Gooey World" ride; Coco ends up falling into the goo. Ending 2 - Coco works at a perfume factory, testing underarm deodorants; Jean-Claude opens up a curtain - "time to test the foot powders!" Released sometime in 2002, due to the use of Paramount's 90th anniversary logo on the cover. 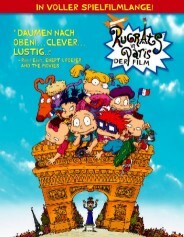 Foreign versions of Rugrats In Paris will be released on video beginning in October. The first of these releases will be in Britain, on 10/8/2001. 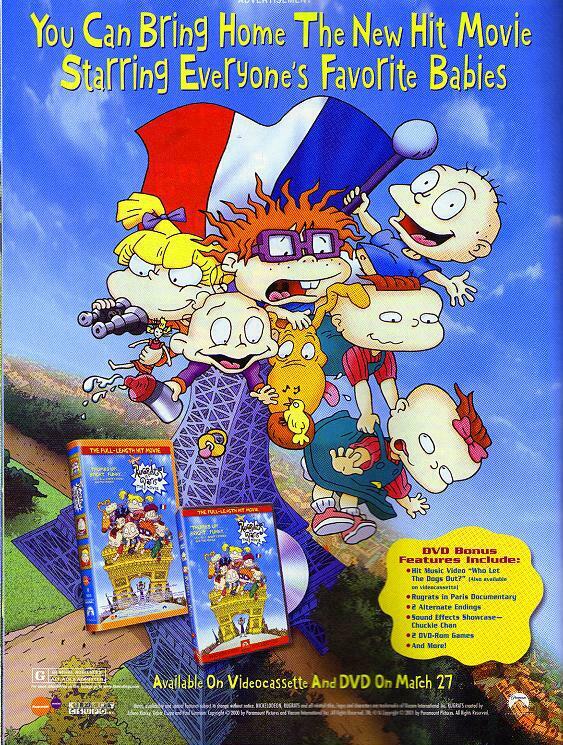 France will be next, on 10/10/2001. More releases will follow during 2001 and 2002. The contents in the foreign video and DVD versions will be the same as the US version, except that some foreign versions (notably, the British & French versions) will have more language selections. 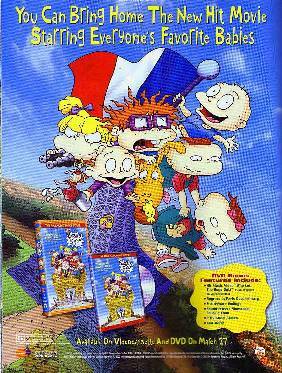 Above: Cases for the foreign versions of the film. 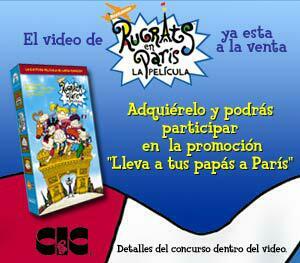 All © 2001 Viacom.